This week on The Bookshelf… Radical’s Time Bomb! When an archeological dig uncovers a Nazi bomb left over from the war, a bomb carrying a deadly virus that will wipe out every person on Earth in a matter of days, an experimental device must be used to save the world. 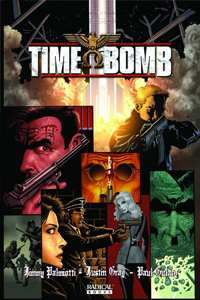 A team is sent back in time 24 hours to stop the bomb from detonating, but instead is sent back to WW2! I really enjoy reading about history, so any story featuring a secret Nazi plot to take over the world definitely interests me! Radical has put out some great books recently, and this is one of them. Not much for history but the time travel interests me.